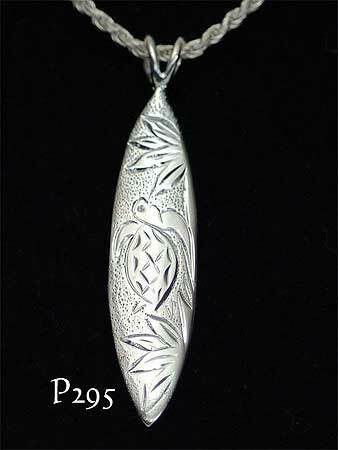 Sterling silver Hawaiian design unisex surfboard pendant. Features a hand carved Hawaiian Honu (sea turtle) set amongst hand carved vegetation. Sanded finish background. The reverse side is highly polished and hallmarked. Also available featuring a dolphin. Measurements: 43mm drop, 10mm at widest. 5.20 grams weight. Loops take chain up to 2.50mm diameter.